Stardust Birthday Party is on!!!!!! A delightful record, a repertoire of zapped self-help ballads - eco therapy punk for statues, infested pigeons and struggling humans alike to sit back and enjoy. Now, on a more serious note :) ‘What’s happening with this record?’ you may ask. Allow me. I woke up this morning and before I could open my inner eye, I realized Stardust Birthday Party should be out! And it was, right on time. So I tapped play and got transported into another dimension, to a 60’s treatment center, where Ron Gallo was wearing a silk celebratory gown, talking to a circle of strung out people about reincarnation and the duality of our souls. There was a loud THUD, and from behind him popped Dylan Sevey and Joe Bisirri with maracas and a bass, reeling everyone in with grit and psychotic sound. 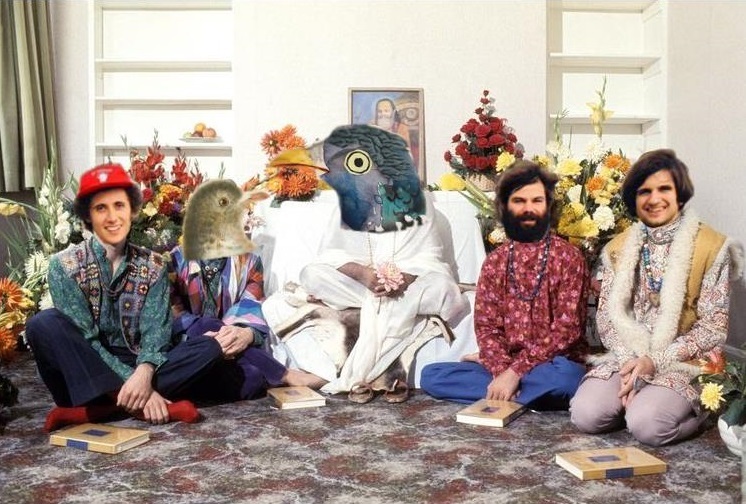 Picture the Beatles when they all went to India, except it’s Nashville with 13 steps to enlightenment. You think you can answer that? Well, think again. Voice says “I know you can’t.” This must mean we have to get detached from ourselves to go further. Now that we know this, it’s time to move on to “Party Tumor.” Hopefully you’ll go listen to it, but in any case, it sounds scuzzy and obnoxious and GREAT. Perhaps, indeed, life if is but a grand long party and you’re just tagging along. Look! But I don't know you and I know you don't care. Not to worry though. Ron jumps in to say that all of this will end at some point, as everything does, that we’re all the same at our core and that we’ll find a way to get through this. Does this mean birth and death are kinda the same thing? And change is good? Anyway, we’re all reborn now, hope you had fun. It’s an awesome album, filled with good reflection time and a lotta wholesome stuff, Ron Gallo and family are sounding as mean and lean as always. You’ve got your classic shrieks, clanks and snaps, with brand new will to live and do good. Best part about it, it makes me feel like we’re all living in the same crazy times, but also that we’re all gonna be alright. So…Ommm. To gain access to the other steps and connect to your very own celestial soul projection, visit www. awakening/rongallo.com.